A brace from Samkelo ‘Bin-Ladin’ Nkosi helped Alexandra United to a 3-0 win over rivals Alexandra FC at Balfour Park on Saturday afternoon. The win cements Alex United’s place atop the SAFA Second Division table with eight fixtures remaining. The teams were deadlocked at 0-0 at the break, but Nkosi’s double and a strike from Kabelo ‘Mr Magic’ Tembo secured the spoils for the log leaders. Nkosi, who was named man of the match, was happy with his performance and thanked the crowd who gathered to support the boys. “I am happy with my performance, thanks to my teammates and the supporters who came to support us. 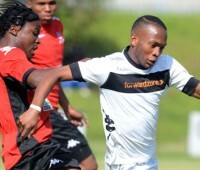 It is my job as a striker to score goals to help the team,” said Nkosi. United next face Tornado FC in Kensington on Thursday, May 1.